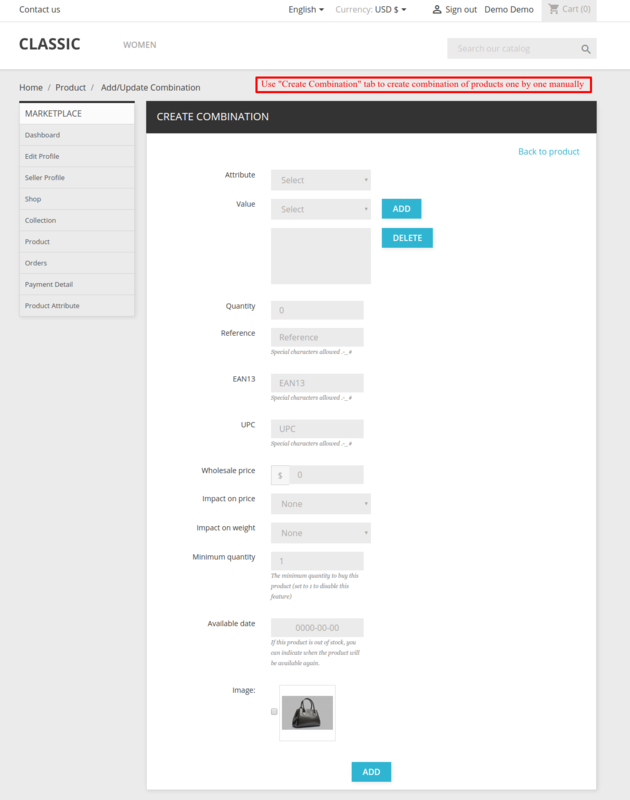 Prestashop Marketplace Product Combination -The module gives seller an option to add combinations to their products. To create combinations for their products. Seller can use all the attributes that are provided by admin. 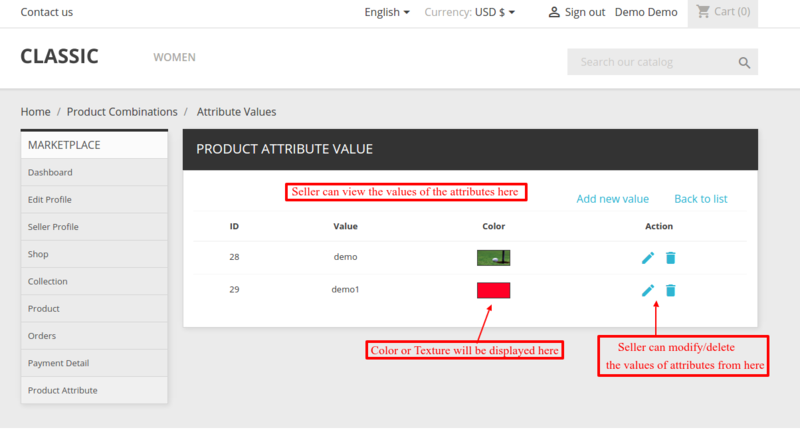 Depending on the Admin configuration, Seller can also add new attributes and its values in different language to create product variants. 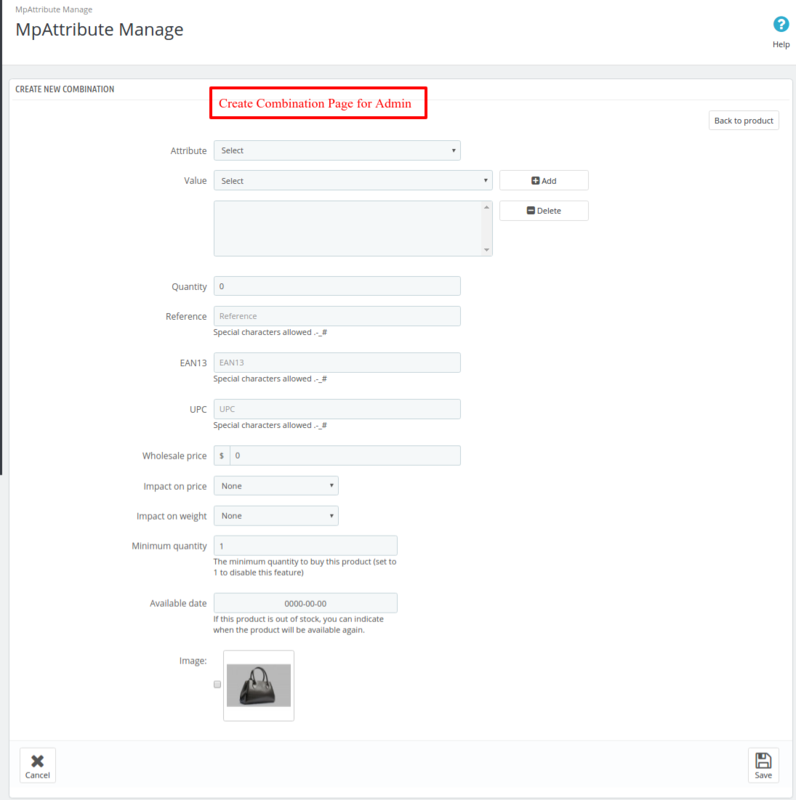 The menu to add attribute will only be available to the seller(s) based on admin configuration of module. Admin can choose whether seller can create/edit attributes or not. Seller can add values to attributes. Attributes and its values can be added/updated in multi-language. 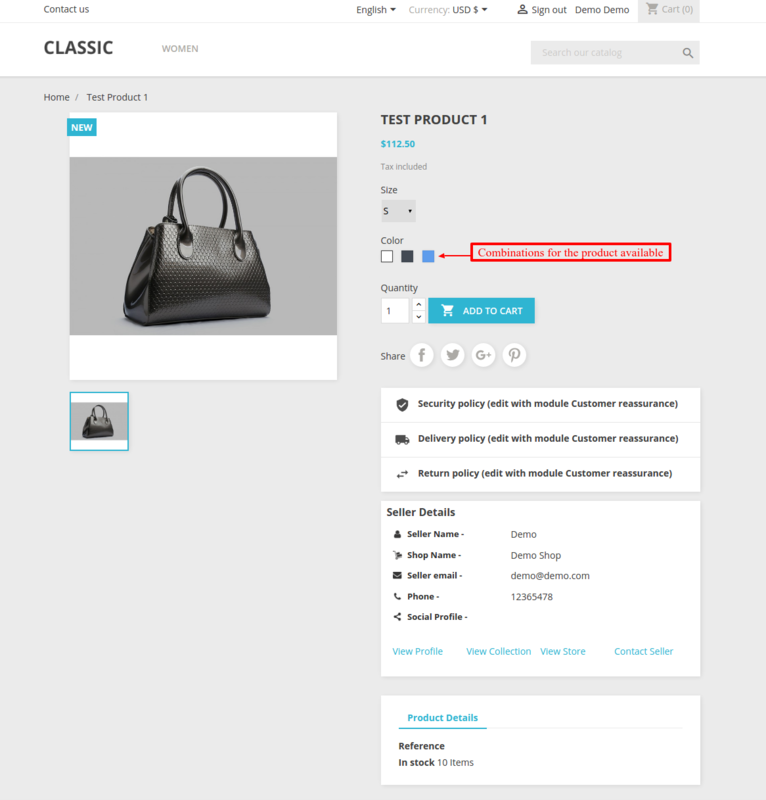 Seller can add existing attributes to its products. Seller can create combination for a product manually. Seller can generate various combinations for a product at a time. Buyer can see the combinations on product page. Admin can edit and delete seller’s attributes. Admin can add values to the seller’s attributes. Admin can view all the combinations added to seller products. Admin can also create or generate combinations for seller products. 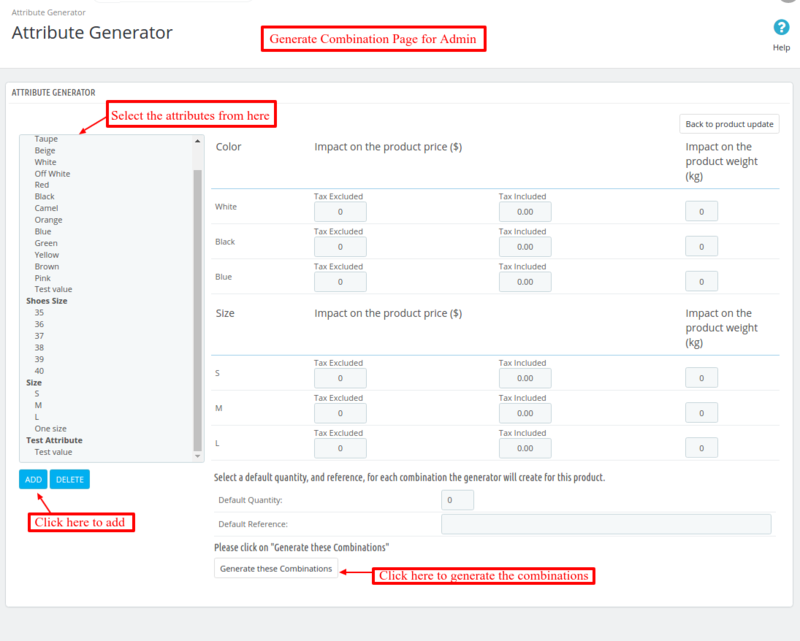 If Product Combination module is installed, then the combinations will also get assigned to sellers while assigning admin’s product to sellers in marketplace. Admin/Seller can change the status of their product combinations if Prestashop Combination Activate / Deactivate module is installed and enabled on the Prestashop site. 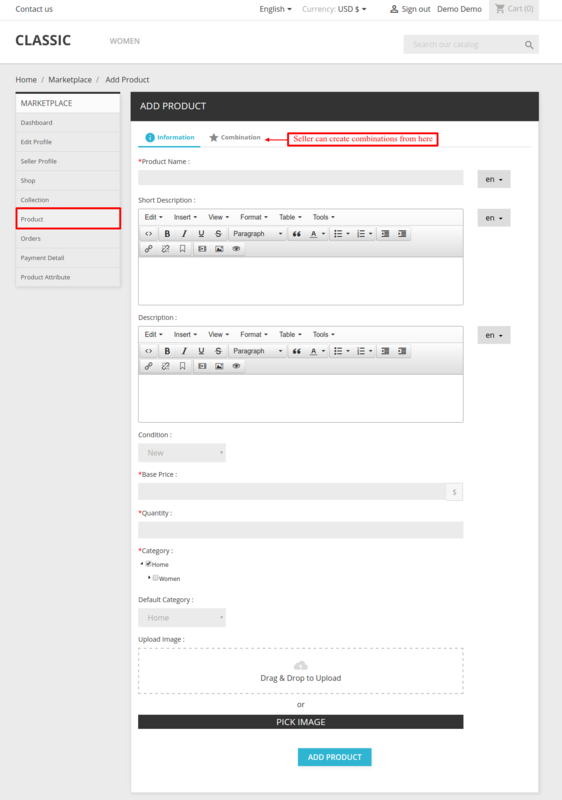 Admin can allow/restrict the seller to be able to change the status of their product combinations. For installing Marketplace Product Combination module you need to install Marketplace module first. After installing marketplace module you can start the installation of Marketplace Product Combination module. After installing marketplace module you can start the installation of Prestashop Marketplace Product Combination. Now the installation is completed. After successful installation, admin can configure the module. If the admin has selected “Yes”, the seller will have the “Product attribute” menu added to the marketplace account. 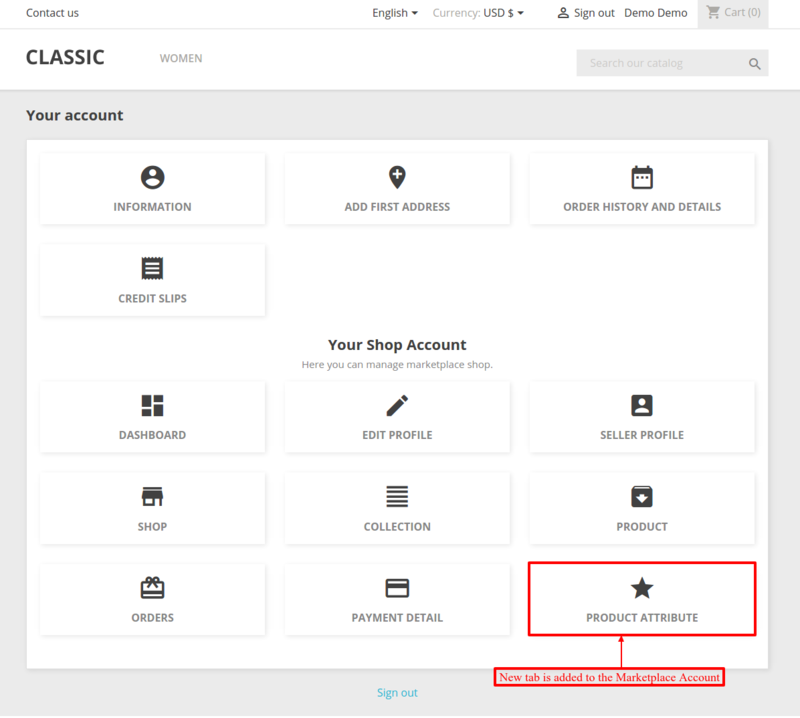 This field is activated only when Prestashop Combination Activate / Deactivate module is installed and enabled on the Prestashop site. 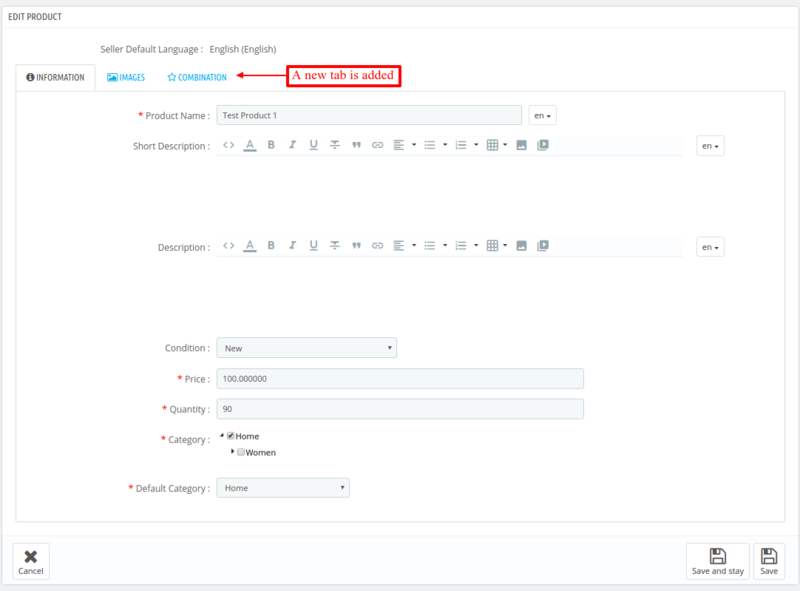 If the admin has selected “Yes, admin and seller will have the option to change the status of thecombination of the product. 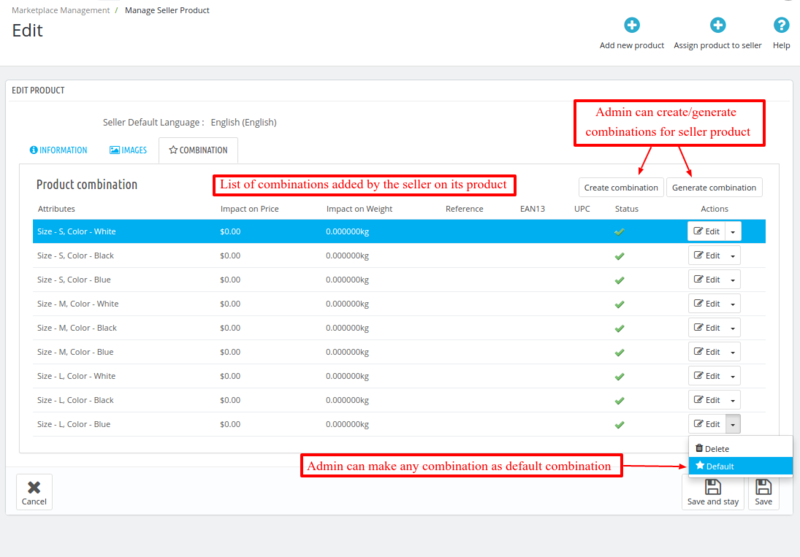 If the admin has selected “No”,admin and seller will not be able to change the status of the combination of the product. After installation of Marketplace combination product module, a new menu gets added ie, “Product attribute” to marketplace account (the menu is visible only when the admin has configured it). 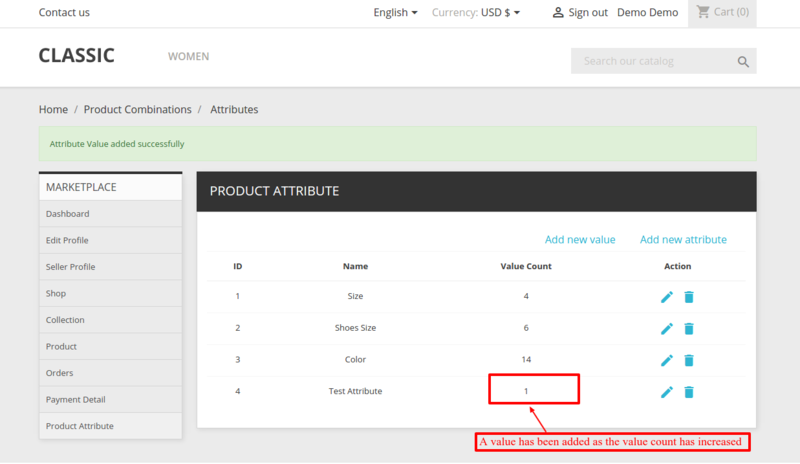 From product attribute tab, seller can view the list of already added attributes and can also add new attribute and its values. Seller can edit and delete the attributes also. *Note:- Seller can delete the attribute only, when the attribute has not been associated with any product. Seller can add attributes and values in multi-language. 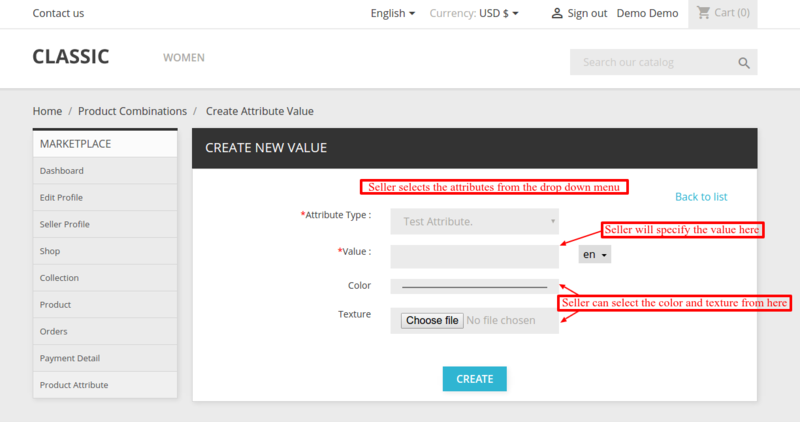 Now, suppose two values are added to the attribute one is any color and other is any texture then seller can view attribute values. 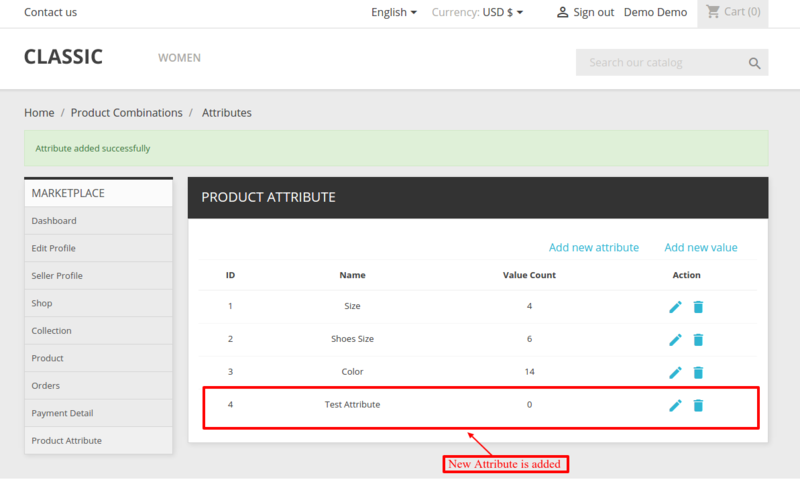 Go to Product -> Add product link in front end, seller can see two new tabs named Information and Combination at the top of the add product form. 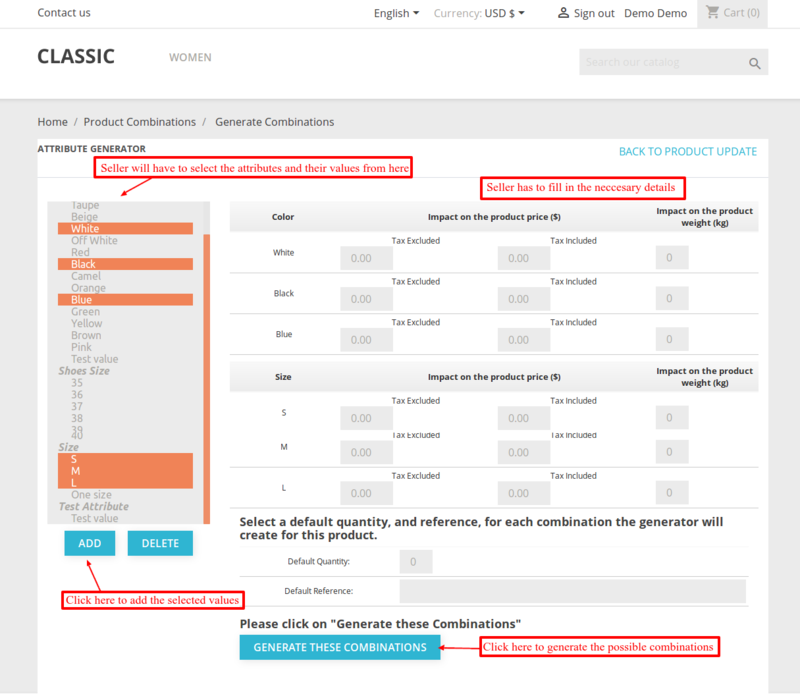 Information tab is for adding details for a product and Combination tab is for generating variant for a product. Sellers can also add combination after saving the product. 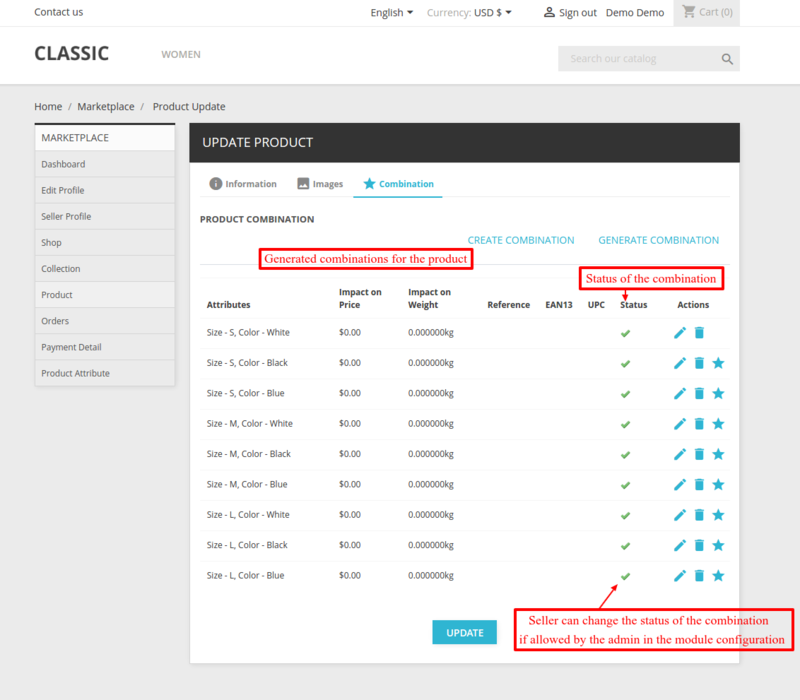 Go to any product update page, now generate the combination, i.e. add attributes with the product. Seller can either Create combination manually one by one or can use the Generate combination to automatic generate all the possible combinations. This way the seller can generate various combination for the product. If combination is already generated then seller will see a list of combination with options like edit,delete, make as default etc. you can modify it from here as per your requirement. Now admin can also view the list of combination added by sellers on their products. Admin can also create or generate combination for seller products. Go to Marketplace management-> Manage seller product.